Welcome to our blog! I'm Carly and i'm lucky enough to be a mummy to two beautiful children, Gracie, 23 months and Zachary, 2 months. As you can tell by the title of my blog neither were particularly small babies! Gracie was born 29th December 2010 by emergency caesarean section weighing 9lb 10oz earning the nickname chunk from her Daddy. Then when pregnant again we named bump chunk 2. 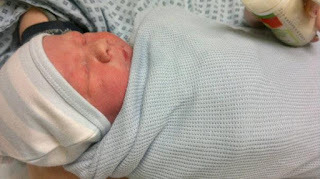 When chunk 2 AKA Zachary made an appearance on 27th September 2012, he weighed a whooping 10lb 4.5oz living up to his nickname! Zach was born by a planned caesarean section. Gracie and Zach live at home in Coventry with Mummy and Daddy. Daddy works in the daytime which means i get to spend my days looking after them. We are forever on the lookout for new toys, games and activities to keep Gracie busy and we will now be writing about all of these. Being a mum there are lots of things you need and lots of different brands selling similar items which makes it so hard to choose anything from nappies, bottles and dummies to pushchairs so we will be posting our personal views on the products we try. So now you know a bit about us and what our blog will be about, i hope that you will enjoy reading our blog and getting to know more about our family. Thank you for taking the time to read!